Home Story Telling Felting Play Mats - Inspiration and Design. As some of you know, I have started a small business selling handcrafted children's toys. It's a small business, just right for the time and energy I have to invest in it. I am experimenting with different venues for selling, such as my own, and the carrot came up Etsy shop, markets, local buy and sells on Facebook, and occasionally through a provincial Childcare support program. I have to say that I'm thrilled with the results so far and absolutely loved buying Christmas presents for family out of my little account! A friend recently asked me where I get the ideas for my play mats. Do I follow designs or make it up as I go along? It just so happened as I was messaging with her that I was, in fact, part way through the design of a new ocean mat. I had recently sold an ocean play mat through my Etsy shop so I wanted to replace it. All of my mats are unique and one of a kind! One of the ways I stay inspired is to create from images I have in my mind of places I seen or been. Places that I have fond memories of. I happen to live in a forest and I love the pallet of color as the sun shines through the trees, the mushrooms, fallen trees with moss and bark. As well, when I visit the ocean I am always drawn to the ever-changing color of sea and sky. I am constantly on the lookout for treasures on the beach whether it be sticks or stones, beach glass or shells. At times I am inspired by a story such as Owl Babies by Martin Waddell. I like to pair a story with a play mat at times as it gives the user a starting point for storytelling and also for imaginative play. If this style of storytelling is unfamiliar it helps to have some ideas of what props could go with the play mat. As a childcare provider, I often use the stories at a gathering time and later will set the play mat up in the room for the children to play with. I am currently in a daycare room with infants and toddlers mixed and we have several play mats that they have used from time to time. They might need a little support to engage their imagination but even at a very young age, they are capable. For this young age, we usually have animals, wood pieces or fabric that work nicely with the play mats we have. As children get older, they can use many more loose part items to enhance their play and in fact, the play mat is often just a small part of the play. It is foundational though as it creates a scene or small world from where the play can start. The very first thing I do when creating a play mat is to arrange the batting or the base of my play mat in an appealing shape. I also make sure that the thickness is even throughout the piece. 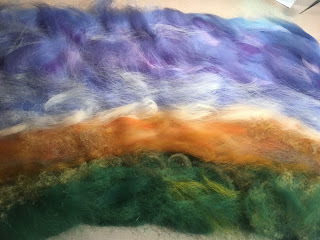 Then I start with the roving and let the color inspire me. I really loved the pink, purple and white in the ocean this time. Have you noticed how sand on the beach also varies in color from place to place? Of course, sometimes it is mostly rocks and driftwood as well. I love adding a bit of silk to embellish and accentuate the waves. I was definitely inspired by Stella Star of the Sea, by Marie Louise Gay for this play mat. My grand-daughter has loved this story through the years and we re-read it again this Christmas together. It's really lovely, in my opinion. Adding in detail comes after all of the foundational colors are in place. Different colored stones and a little kelp is what I was going for here. This purple starfish is a memory from a family trip to Oregon a few years ago. We actually thought it was dead at the time as the tide had gone out, it was stranded and it wasn't moving. And then it did move and so we put it in a tidal pool and were glad it was fine. When all of the details are in place I get down to the actual wet-felting process. As this play mat is fairly large it took me about an hour and a half to felt it well. When it is dry I add or touch up some details or parts that I feel need it and then voila! The project is complete. I always hope that these little creations of mine find their way to a happy home where a child can play and imagine and learn and think! I recently got some positive feedback from someone who gave one of my play mats to her daughter for Christmas and she was thrilled and therefore I was thrilled! It just made my day to hear that she was happy and the play mat was being used. Celebrating and Promoting imaginative play for children. Will had a really great time with your family. Thank you for your hospitality to him. I sure have fun playing around with wool! !